If a student is troubled and struggling in math, there is a teacher who requests that he or she is assigned to her geometry class. She also teaches the top students in Center Hill High’s PSAT class. She understands struggles. She understands setbacks. She also understands setting goals and persevering though every obstacle in her way. These are a few of the reasons Judith Terry, 34, has been named the 2017 DeSoto County Schools’ Teacher of the Year. “Mrs. Terry has a wide range of content knowledge in math and uses this to teach the entire spectrum of students at Center Hill High,” said CHHS Principal Doug Payne. Nineteen years ago, an automobile accident threatened Terry’s life. Her feet, back, and nose were broken and many teeth were knocked out. Her injuries required a five-week hospital stay and a total of 10 surgeries, the latest being a year ago when the bones in her foot were operated on for the third time. It took nine months from the time of the accident to regain her ability to walk, but she considered her medical condition only a temporary setback. While she knew her original plan to become a veterinarian was dashed because of the physical requirements, she pursued a technical degree through Northwest Mississippi Community College and worked in a bank for 14 years. As a teenager, she never considered becoming a teacher. At 28, she felt differently and started over in college to earn a liberal arts degree through the University of Mississippi in math, sociology and history. Terry said her father worked as an inspector for the MS Department of Transportation and her mother was a nurse. Both loved mathematics. 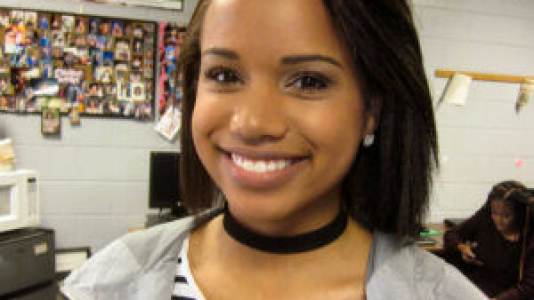 This fact, coupled with strong math teachers throughout her high school years, made her understand real world applications of mathematics and helped her become the valedictorian at Independence High School. In 2012, she earned a certification in secondary mathematics as a Mississippi Highly Qualified Teacher. She began her dream job as an algebra and geometry teacher at Center Hill High School. She currently teaches geometry and PSAT/ACT math. She also tutors students in algebra, geometry, trigonometry, statistics, calculus, ACT math, and SAT math. Since 2014, she has served as chair of CHHS’ math department. Terry’s classroom is student centered with problem-based cooperative learning. Lessons are designed to engage all learners through open-ended questions which include hands-on, guided activities that lead to making discoveries and connections. Each lesson incorporates one or more of the Eight Standards for Mathematical Practice. Students are challenged at high levels in order to attain growth and are assessed informally through discussions, observations, written reflections, and formally through quizzes, exams, and projects. Mrs. Terry’s classroom prepares students for college and the workplace by incorporating group assignments and presentations that develop and improve teamwork and communication skills that are vital to success after high school. Since becoming the PSAT math teacher in 2014, Terry has helped propel one student to National Merit Semi-finalist status and four students to National Merit Finalist status. The 2016 class of PSAT students saw an average of 70 points growth in math and 130 points growth overall on the PSAT exam. 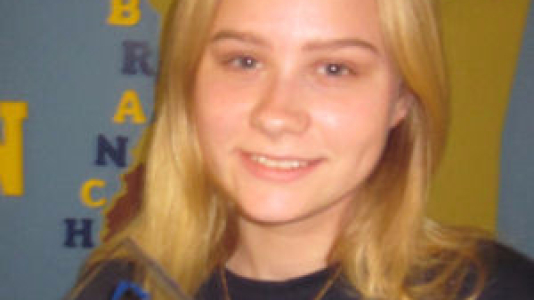 Seven of those students scored in the top one percent of 11th grade testers nationwide. Terry is a proponent of higher education and works diligently with students planning for college. She has worked one-on-one with many students to achieve ACT scores required for nursing and veterinary programs and to reach higher levels of scholarship funding. Prior to teaching, Terry was a 17-year volunteer in the Independence FFA Alumni where she worked at the local, state, and national levels to promote agricultural education, career development, and leadership skills in Mississippi’s youth. She has also been an active volunteer with Tate County 4-H. While Tate County is still home, she said she gladly makes the 35-40 minute drive to CHHS each day because she can think of no better place to teach. She has served as a freshman and sophomore class sponsor, Diamond Girl sponsor and Archery coach. Terry is an active member of The Grove Baptist Church where missions extend far beyond the church walls and include local, national and international activities. Judith Terry is married to Jay Terry and they have one daughter, Randi Leigh, a 10th grade student at CHHS. Horn Lake High counselors decided to make National School Counseling Week all about students instead of themselves. Teresa McGuire, a counselor at HLHS said, "We wanted our students to meet community leaders and realize people outside our school care about them." 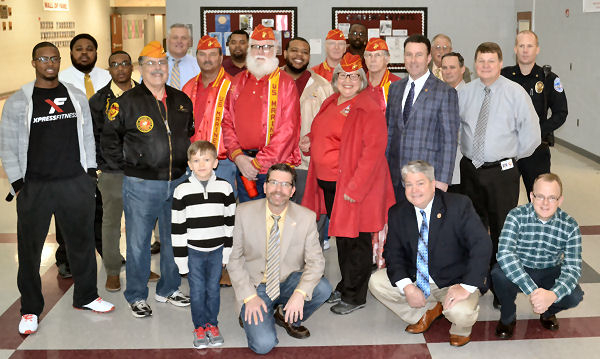 By 6:45 a.m. on Monday, February 6th, elected officials, VFW members, church leaders, school officials, firefighters and policemen flanked the entrance to HLHS, shaking hands and greeting students as they entered the building. 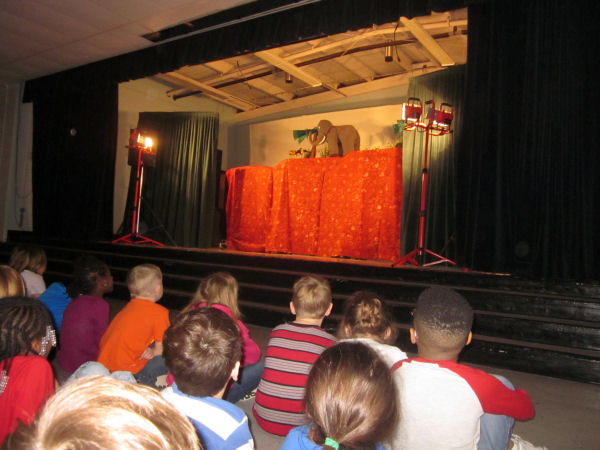 Students at Olive Branch Elementary were introduced to a professional puppet arts theatre, thanks to a grant from the Mississippi Arts Commission and the National Endowment for the Art. The Puppet Arts Theatre is on the Performing Arts Touring Program of the Mississippi Arts Commission and uses expressive rod and hand puppets. DeSoto Family Dental Care sponsored the Teachers of the Year reception at the Board of Education. The Teacher of the Year Program focuses public attention on excellence in teaching. 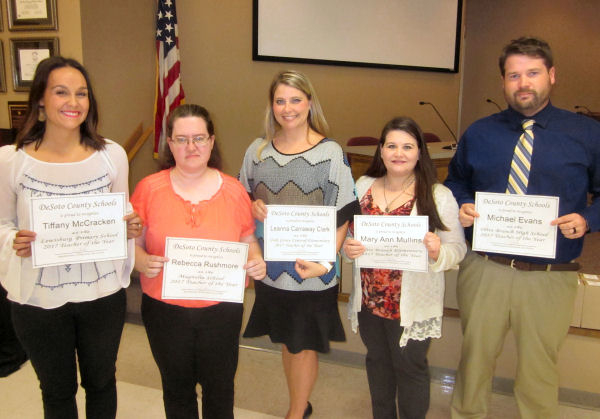 DeSoto County School District honored 41 teachers who were nominated for the 2017 DCS Teacher of the Year. The 41 nominees won the title at their respective schools. The district winner was Judith Terry, a math teacher at Center Hill High School. 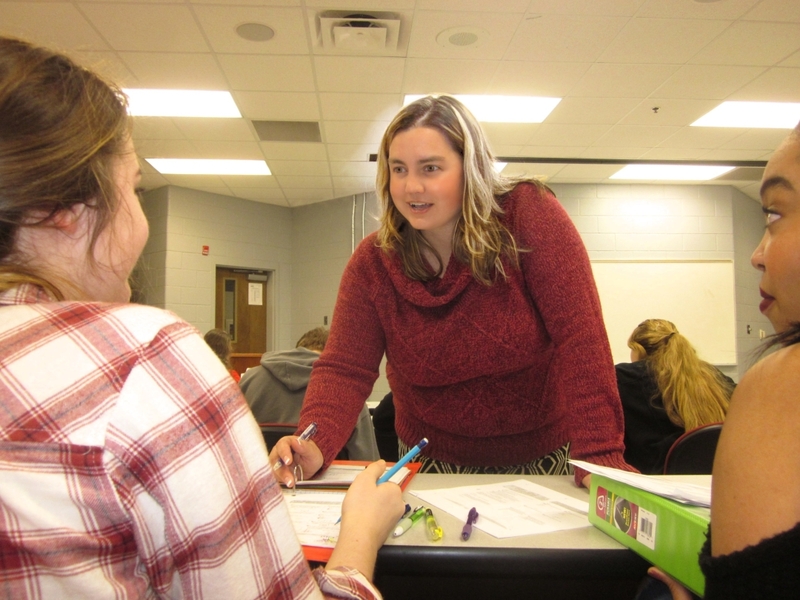 She will be entered in the Mississippi Department of Education’s Teacher of the Year contest. This group has a lot in common. All are experts in their fields who guide students of all backgrounds and abilities to achieve excellence. They collaborate with colleagues, students and families to create a school culture of respect and success. They demonstrate leadership and innovation and express themselves in an engaging and articulate way. At DeSoto County Schools, this group now becomes the 2017 Teacher Advisory Council to the Superintendent, representing their faculty at the district level. They will make recommendations to the superintendent regarding the school calendar, and policies and procedures that could be improved or changed. 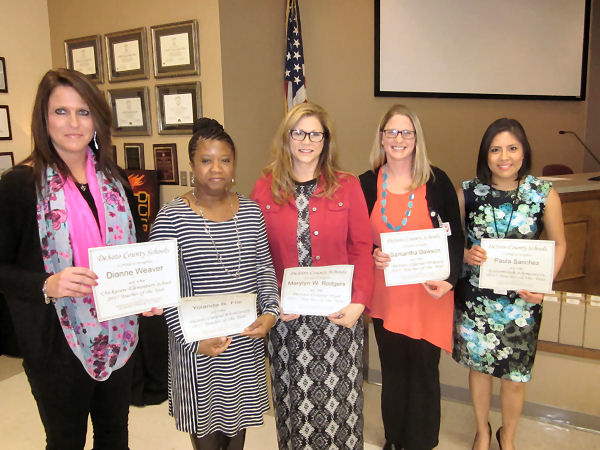 Teachers of the Year from left, Dionne Weaver, Chickasaw Elementary; Yolanda Flie, DeSoto Central Elementary; Marylyn W. Rodgers, DeSoto Central High; Samantha Dawson, DeSoto Central Primary; Paula Sanchez, Greenbrook Elementary; and (not pictured) Kirk Stockett, DeSoto Central Middle. 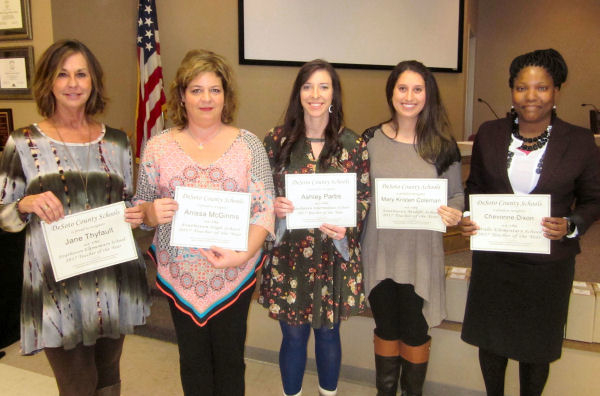 Teachers of the Year from left, Lori Edge, Hernando Elementary; Holly Neel, Hernando High; Carla Smith, Hernando Hills Elementary; Rachel Fragale, Hernando Middle; and Ashley Sommerfeld, Hope Sullivan Elementary. 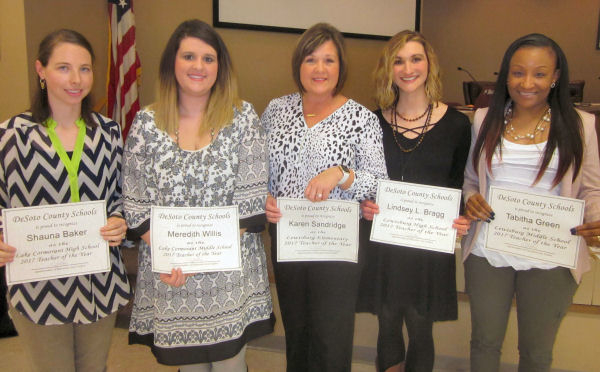 Teachers of the Year, from left, Jane Thyfault, Southaven Elementary; Anissa McGinnis, Southaven High; Ashley Parbs, Southaven Intermediate; Mary Kristen Coleman, Southaven Middle; and Chevonne Dixon, Walls Elementary. 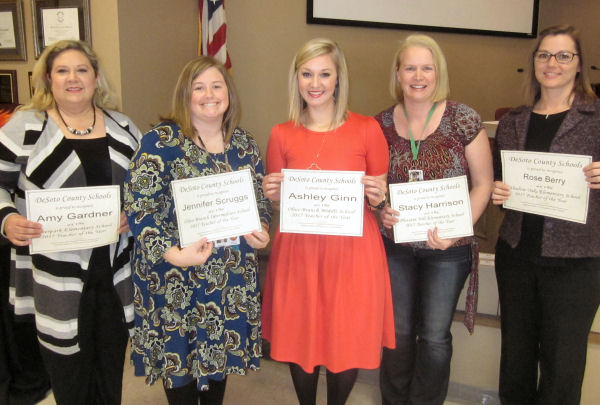 Teachers of the Year, from left, Amy Gardner, Overpark Elementary; Jennifer Scruggs, Olive Branch Intermediate; Ashley Ginn, Olive Branch Middle; Stacy Harrison, Pleasant Hill Elementary; and Rose Berry, Shadow Oaks Elementary. 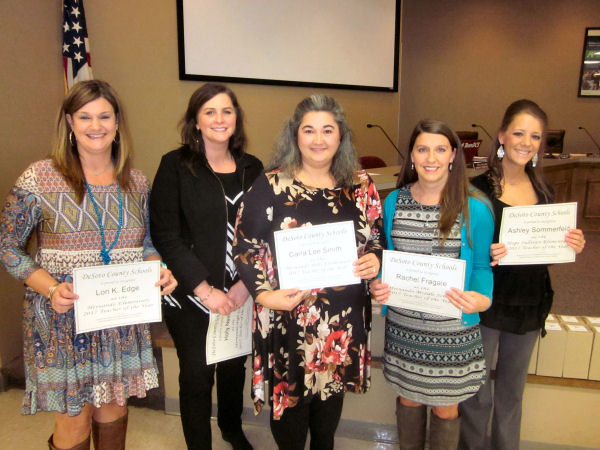 Teachers of the Year, from left, Tiffany McCracken, Lewisburg Primary; Rebecca Rushmore, Magnolia; Leanna Clark, Oak Grove Central Elementary; Mary Ann Mullins, Olive Branch Elementary; and Michael Evans, Olive Branch High. 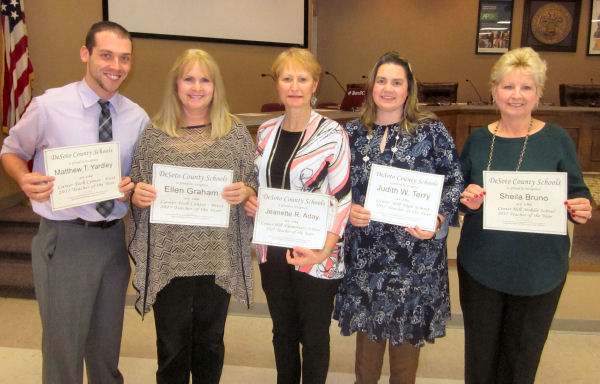 Teachers of the Year, from left, Shauna Baker, Lake Cormorant High; Meredith Willis, Lake Cormorant Middle; Karen Sandridge, Lewisburg Elementary; Lindsey Bragg, Lewisburg High; and Tabitha Green, Lewisburg Middle. Teachers of the Year from left, Matthew Yardley, Career & Technical Center-East; Ellen Graham, Career & Technical Center-West; Jeannette Aday, Center Hill Elementary; Judith Terry, Center Hill High; and Sheila Bruno, Center Hill Middle. 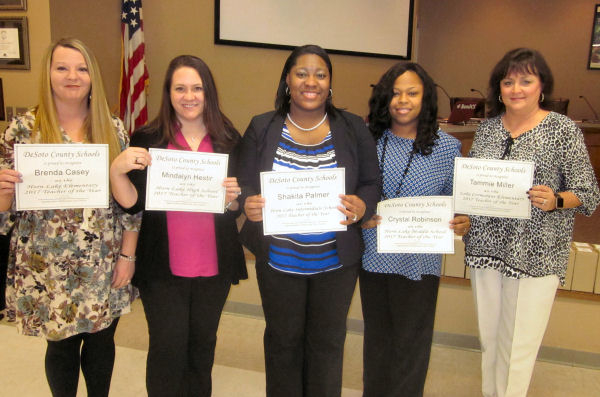 Teachers of the Year from left, Brenda Casey, Horn Lake Elementary; Mindalyn Hestir, Horn Lake High; Shakita Palmer, Horn Lake Intermediate; Crystal Robinson, Horn Lake Middle; and Tammie Miller, Lake Cormorant Elementary. Stacey Graves, DeSoto County School District’s chief financial officer, received the “Outstanding School Business Official” award at the statewide meeting for Mississippi Association of School Business Officials (MASBO), an organization of 650 members that represent the state’s 152 school districts and collectively manage more than $4 billion in expenditures each year. 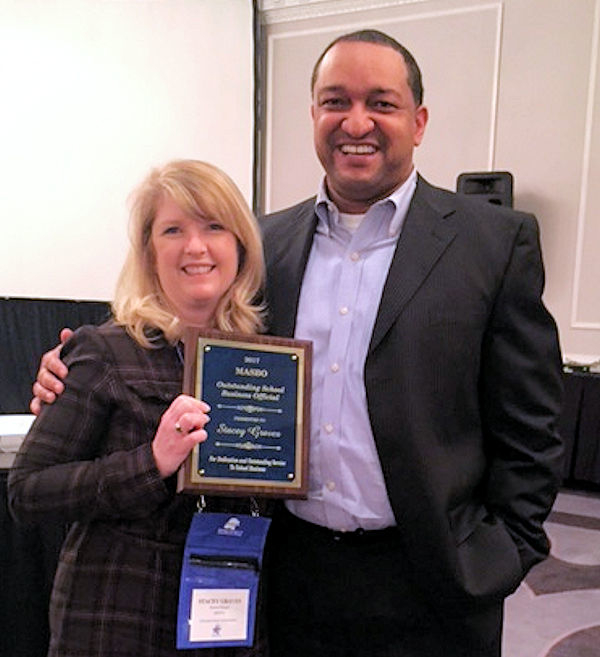 Graves, a former president of MASBO, was recognized “for dedication and outstanding service to school business” at their meeting in Jackson in February. 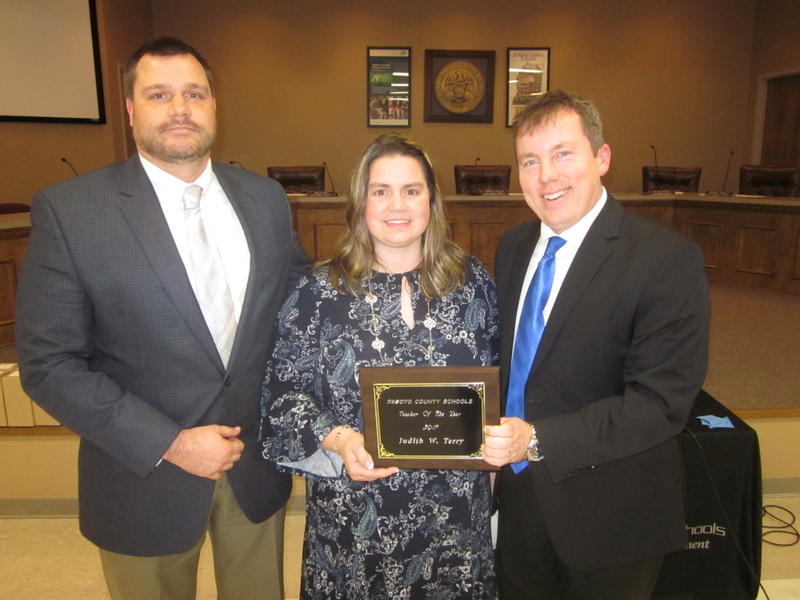 She was nominated for her active role in the association, mentoring other district’s business managers, her involvement in association committees and because DCS continually receives good audits. Cameron Sweeney and Karsyn Laufenberg have worked on this project for all three years. Empty Bowls is a national program that the LHS Interact Club has adopted. 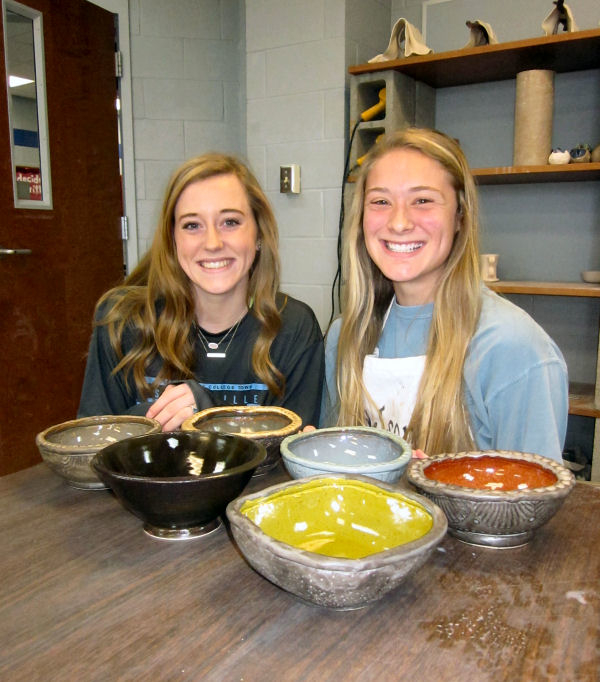 At Lewisburg High School, the Empty Bowls Project uses ceramic arts to fight hunger in DeSoto County. Organized and run by the LHS Interact Club, students, potters and artisans donate hand crafted bowls. Guests select one of the bowls and are served soup and bread, donated by local sponsors. They take home their bowl as a reminder of how many go empty around the world. Boler said proceeds from the effort are split between the Interfaith and Olive Branch Food Pantries. Last year both organizations were thrilled when the Interact Club presented them with a check for $12,000. The event is sponsored by community businesses leaders who provide soup, supplies and monetary contributions. Georgia Dunning is putting her finishing touches on a bowl before she fires it in the kiln. She used her thumb to add detail to the bowl. While most of the bowls are made by the students in LHS art classes, any student can come to Art Teacher Eric Beavers’ classroom and make a bowl. 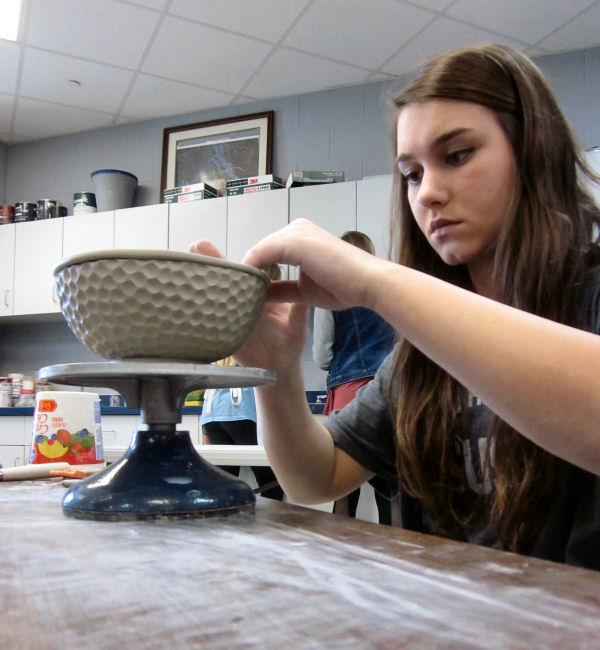 Students use their lunch hours and time after school to make clay bowls, each one being an original article. Beavers has a large kiln in his classroom and helps students fire their clay to make a functional piece of art that is dishwasher safe. CJ McCreary has made more than 40 bowls in the last two years. He had never tried art before he volunteered for this project. 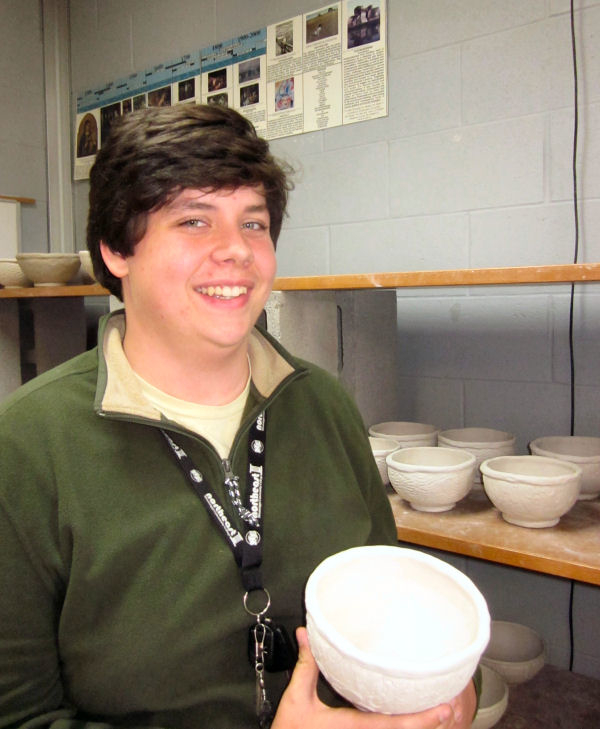 CJ McCreary joined the Interact Club last year and has made more than 40 bowls. “I had never tried anything like this before, and I learned art class was a fun place to hang out and work,” he said. Cameron Sweeney said she gets enjoyment on this year-long project knowing it will go toward helping other people. 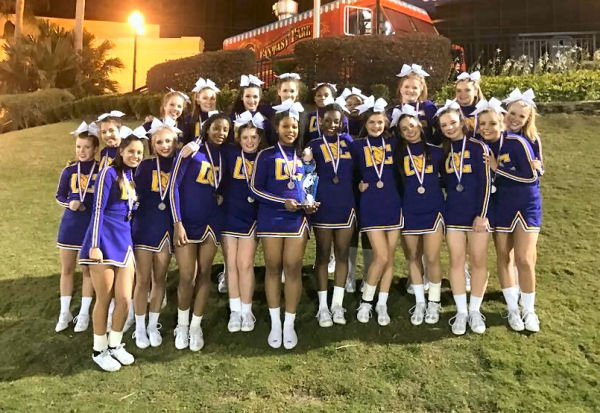 DCHS Varsity Cheer earned 8th in the Nation and 3rd in the World. 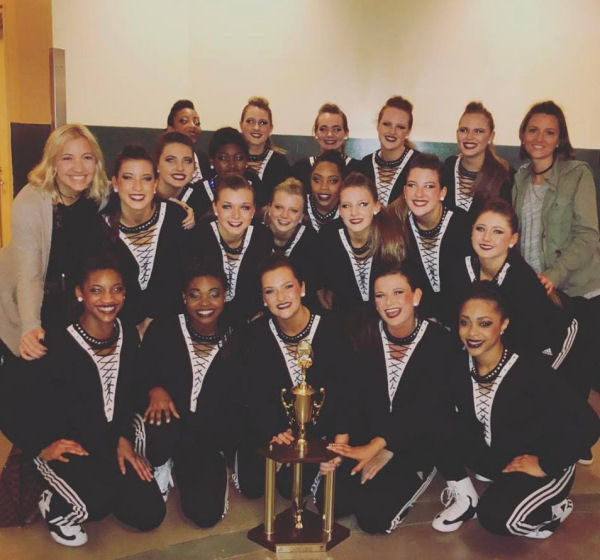 Center Hill High School Dance Team won 8th place in Medium Hip Hop at nationals. 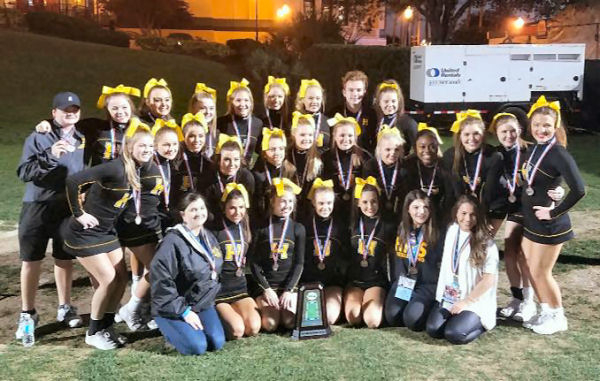 Hernando High School cheerleaders are 3rd in the Nation in their division for the 'Game Day' competition. All they have to do is complete five acts of service…and not tell anyone why they are doing it. 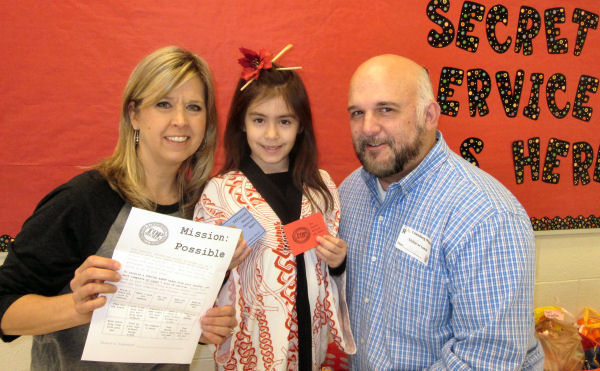 After students complete at least five acts of service, they return their forms to their teachers along with their parents’ signature when “they have completed their mission.” If they follow their “Top Secret” directives, they will receive SPECIAL AGENT badges from their teacher. Give a toy away that they don’t play with anymore. Organize a game night for their family. Read a story to their little brother or sister. Have extra play time with their pet. Pick up toys without being asked. Free choice. Find a need and meet it. The program was launched by LPS Counselor Penny Martin. Her daughter is in the second grade at LPS and has embraced the concept. After taking extra play time with their dog and filling his food bowl, she decided to leave her dog a red card that read: The Secret Service was here! 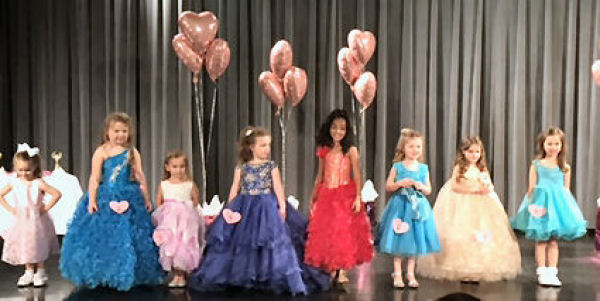 There were 58 contestants in the Miss Heart of Hope Pageant. Community service and collaboration are the two success ingredients that made the first Miss Heart of Hope Pageant kick off in a big way. With 58 contestants from all over DeSoto County, ages 2 to 14, this pageant was a little different than most. It was designed to raise money for the Magnolia School, and every contestant was a winner. All left with crowns. DCS’s Magnolia School is a special education school serving the needs of students with emotional and behavioral needs. 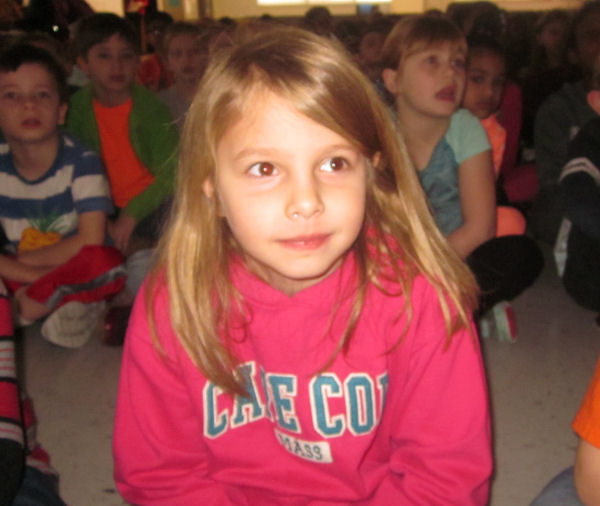 The $3,000 raised will launch an activity fund that will pay for the school’s new “Stop and Think” behavior modification program and additional instructional and behavioral intervention resources. Assistant Superintendent Jennifer Weeks chaired the project, but she credits her daughter, Gracie, with coming up with the idea. Gracie, a sophomore at Lewisburg High, is the reigning Miss Teen DeSoto County Magnolia. She is a student who likes pageants and thought this would be a creative way to work community service hours. Gracie Weeks helped distribute crowns to all contestants. “We crowned queen, first alternate, second alternate, third alternate and future queens in each division. There were other awards including most photogenic and best model. 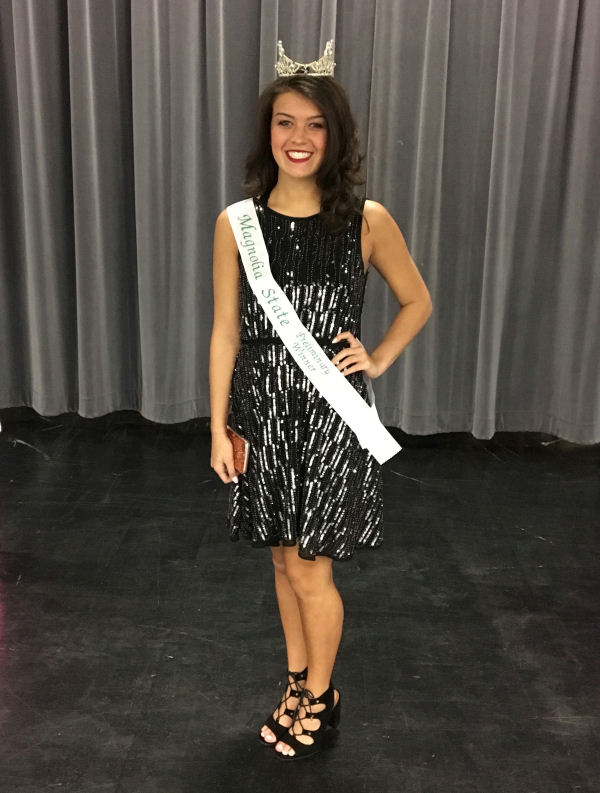 The pageant was open to girls from birth to high school," Mrs. Weeks said. Many teachers from the Magnolia School, the Special Education Department, and the County Office staff volunteered to help run the Saturday morning pageant. They judged, ushered and directed the parents and friends who came to encourage the young contestants. Every seat in the DeSoto Central High Performing Arts Center was filled. Emily Ballard, special education supervisor of the Magnolia School, said she appreciated how this pageant gave her teachers recognition. “These teachers face serious challenges in the classroom every day. They work incredibly hard, spend their own money, and rarely get acknowledgement, so this was very nice for them,” Mrs. Ballard said. 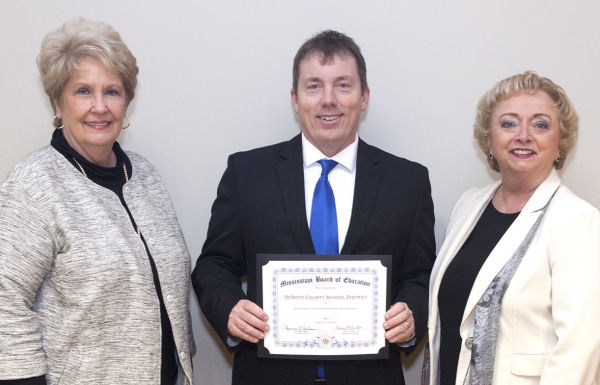 Superintendent Cory Uselton received recognition at the Mississippi Board of Education for DeSoto County School District being named to the AP Honor Roll. Board Chairman Rosemary Aultman and State Superintendent Carey Wright presented the award. 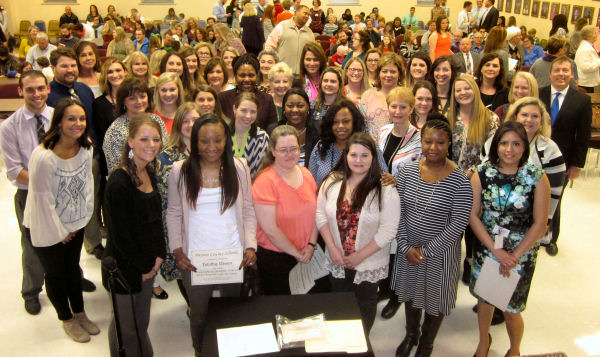 DeSoto County Schools was one of three districts in Mississippi honored. The AP District Honor Roll recognizes school districts across the U.S. and Canada for increasing AP access to students while simultaneously maintaining or increasing the percentage of students earning AP exam scores of 3 or higher. AP District Honor Roll recipients are committed to expanding the availability of AP courses among prepared and motivated students of all backgrounds. 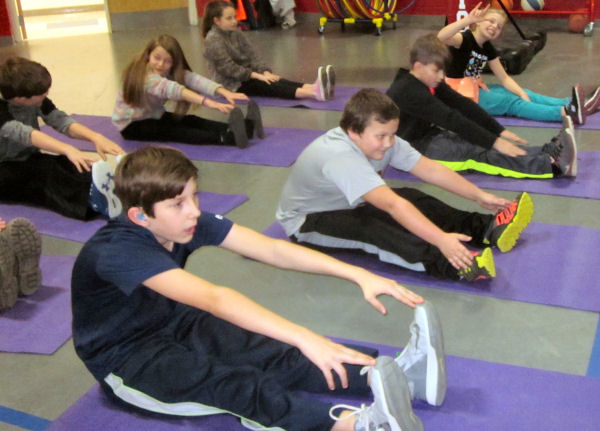 Students at Lewisburg Elementary School learned a lot about eating right and exercising more from experts in the Healthy Lifestyle Network, a team from the University of Tennessee/LeBonheur Children’s Hospital Pediatric Obesity Program. With the aid of 40 volunteers from the Lewisburg High Interact Club and the University of Memphis’ Phi Mu Sorority, groups of LES students circulated through eight stations, gaining valuable knowledge to promote a healthier lifestyle. At one station students were blindfolded and got to sample healthy food snacks, like kiwi and hummus. They had to guess the foods and rate them. 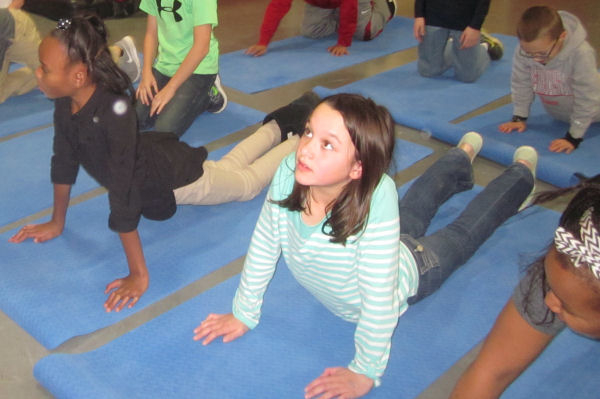 At another station, students learned the difference between muscle and fat--how it looked and how it acted in their bodies. Next, students learned how a “healthy plate” is constructed and about portion control on food choices. Other stations involved yoga basics, strength and conditioning exercises to strengthen their core, and a “Move It…Move It” station where students practiced Zumba. One of the most popular stations involved students guessing how many teaspoons of sugar were in a soft drink. The correct answer was 16 teaspoons of sugar. On a Pink Palace tour, Mrs. Morrison saw a display about the Healthy Lifestyle Network, and contacted them about a school visit. She found out there was no charge for this team of professionals to come to her school and use hands-on nutrition, fitness and motivational sessions to improve fitness, well-being and metabolic outcomes. For more information about Le Bonheur’s Healthy Lifestyle Clinic, contact HLC@lebonheur.org or call (901) 287-7337 or (866) 870 5570. 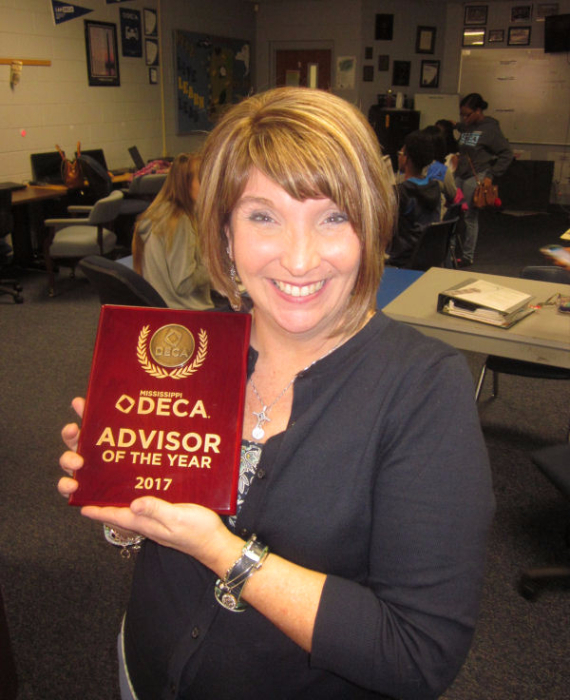 A group of Olive Branch High students and their teacher earned top honors in this year’s state DECA competition in Jackson, MS.
OBHS Teacher Vicki Sullivan was named Mississippi DECA Advisor of the Year. 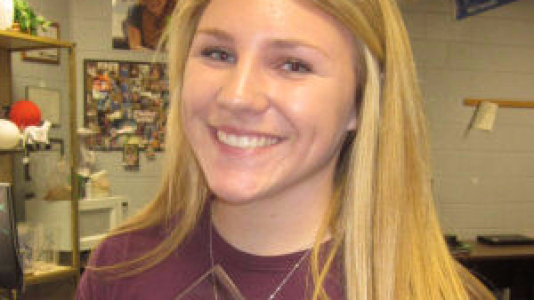 Forty-six OBHS students attended the three-day conference, and 27 placed in the top six of their events. Thirteen students have qualified to go to the International Career and Development Conference in Anaheim, California in April. 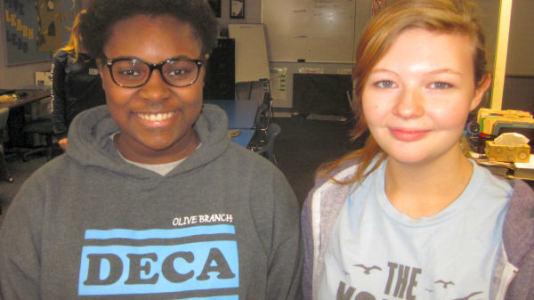 DECA is an international association of high school students, college students and teachers. The organization focuses on leadership preparation in marketing, management and entrepreneurship through business, finance, hospitality, marketing sales and service. “These students have worked extremely hard to reach this level of competition,” Mrs. Sullivan said. Zoe Snyder was elected as 2017-2018 District 2 Coordinator (formerly District 2 Vice President) and Kameron King was elected as 2017-2018 Vice President of Marketing. Both of these students are State Officers for the year. DeSoto County School Board members are: Board President Ann Jolley, District 3; Milton Nichols, District 1; Shelia Riley, District 4; Michele Henley, District 2; and Sarah Doss-Thomas, District 5. 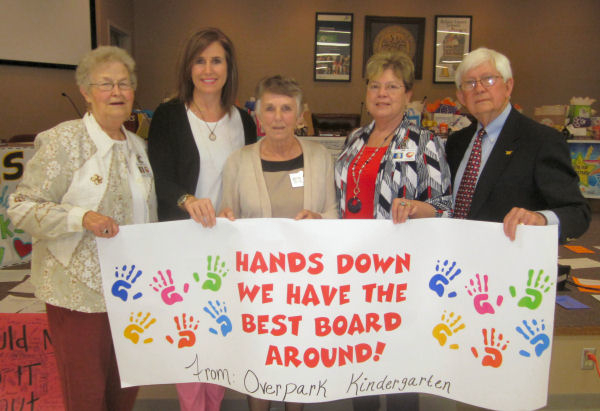 Once a year, DeSoto County School District makes the extra effort to thank school board members for the work they do on behalf of more than 33,000 students. Board members receive artwork, cards and handmade items from students. DeSoto County's Board of Supervisors issued a proclamation recognizing the work and responsibilities of the board. 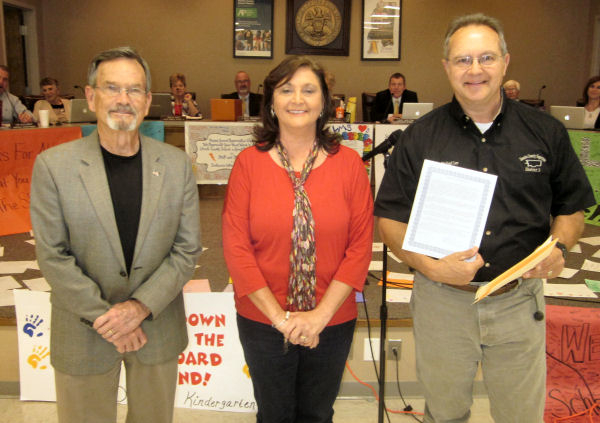 Supervisors Bill Russell, Lee Caldwell and Michael Lee attended the board meeting and read the proclamation. "I appreciate the fact that our school board members put the children first in every decision they make,” said Superintendent Cory Uselton.